Our honeymoon destination and we were very pleased with everything,look forward to returning soon. Nice location to everything, very quiet probably do to the off session. Will look forward to staying again in the future. Thanks for everything. We absolutely loved this little place! So cozy & close to everything! The refrigerator wasn’t cold but that was our only issue. Perfect! We had a wonderful week and enjoyed our stay. We will definitely book with cabins usa. Very nice cabin to just relax. Loved the view looking over Pigeon Forge. Bedspread needs cleaning,no place to hang coat or clothes upstairs,stairs are steep and steps are narrow hard to getup and down .Very nice cabin for 2 people,close to parkway. The Angel's Ridge cabin was very nice and we would stay there again, but we had to move there after the original cabin we booked had a mattress that was so poor that we could not sleep there. This cabin was very nice, but the mattress here had a depression in the middle that was also uncomfortable. This may have been aggravated by the poor condition of the first bed. The cabin is in need of some repairs, the staines on the ceiling in the bedroom were unsightly. The jacuzzi tub was dirty. Once we started running water in it you could see dirt and hair floating in it. The only problem we had was the stairs going to the bedroom. The steps are very narrow and the handrail does not go all the way to the top. My wife has back problems and the stairs were very uncomfortable for her. Next time we will try to find a unit that has no stairs. 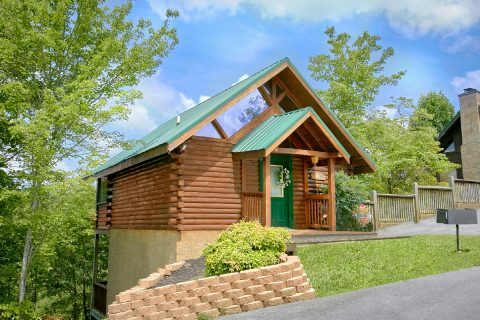 Beautiful and quaint little cabin just a few minuets away from the heart of Pigeon Forge. The cabin was very clean and well maintained. My husband and I enjoyed soaking in the hot tub on the balcony. The cabin is in a very good location and not difficult to get to. If we were on the strip of Pigeon Forge, it was easy for us to quickly go back to the cabin if we needed something. We chose express check in and that made it very easy. We kept ourselves busy until it was time to check in. We were emailed the key code, so all we had to do was go straight to the cabin when we were ready. We highly enjoyed our stay. We will definitely remember Angel's Ridge and plan to book here again when we come back in the future! Highly recommended! Nice cabin but the bedroom is downstairs and never warmed up to a comfortable setting. Overall very nice and very clean cabin! We very much enjoyed!! Very impressed. Appreciate the staff. Nice little cabin and not to far off main road and convenient location. Cabin was very nice but the bedroom downstairs was freezing, lucky if it was 60 degrees ,the thermostat was set on AC at 72 , the temperature high was 72 that day, we turned off the AC hoping it would warm up and and the next day the outside temperature dropped to the 50's we turned the heat on hoping that would warm up the downstairs but the warm air coming out of the down stair vents was coming out with very little pressure so after 5 days I believe the temperature downstairs was still about 66 or 67 far too cool for me since I don't know how they would increase the pressure I personally would not stay there again but as I said, the cabin was very nice. The cabin was great. Close to all kinds of activities,something for everyone. Will recommend to others. Plan on staying again in the near furture. Had a great stay. Thank you for taking the time to let us know about your recent stay in Angel's Ridge! We here at Cabins USA strive to give each of our guests the same great stay you enjoyed while vacationing in the Smokies. I apologize for the issues you experienced with the toaster and cable. your comments have been forwarded to our maintenance department to be addressed. When you are ready to stay with us again, please mention you are a return guest for an additional discount. Thank you for choosing Cabins USA and we look forward to seeing you again soon! We love this cabin! It is close to all the action in Pigeon Forge, but you feel like you are in the middle of the deep woods--all quiet and peaceful! I love that I was drinking my morning coffee outside on the enclosed upstairs porch watching a very cute squirrel with a very long tail play in the tree near the porch. The cabin is beautifully decorated and well kept. It has everything you need for your stay--cookware, utensils, coffee maker, electric can opener, mixer, dishes, dishwasher, fridge, washer-dryer, and (I noticed that another person's review said there are no frying pans) we found the frying pans in the drawer of the stove. The air conditioner is the best I have ever seen in a rental property. We loved the jacuzzi and hot tub, and the porch swing on the lower outside deck. Although we did not use the swimming pool, it is easy to find and seems very nice. One concern you might consider, however, is the stairs going from the main floor to the downstairs bedroom are very steep with narrow width steps. We highly recommend this cabin, hated to leave, and will return in the future to CabinsUSA. We have stayed in CabinsUSA cabins in the Pigeon Forge area three times now, and each time we had a pleasant experience. Thank you for taking the time to let us know about your recent stay in Angel's Ridge! We here at Cabins USA strive to give each guest the best stay possible while vacationing in the Smokies. When you are ready to stay with us again, please mention you are a return guest for an additional discount. Thank you for choosing Cabins USA and we look forward to seeing you again soon! Angel's Ridge was perfect for us; close to the Parkway, not difficult to find, with all the amenities we'd hoped for, very clean and ready for us upon arrival. It was a 10 in every aspect. The only issue I had, and it was minor was parking. I drive a full sized double cab pickup making parking a little tight. I would recommend Angel's Ridge and Cabins USA to anyone without hesitation. We're already planning our next visit, THANK YOU! Thank you for all of your kind words! We here at Cabins USA strive to give each of our guests the best stay possible while vacationing in the Smokies. When you are ready to stay with us again, please mention you are a return guest for an additional discount. Thank you for choosing Cabins USA and we look forward to having you as our guest again soon! We couldn't connect to wifi, contacted customer service and maintenance came out very quickly. The cabin is perfect for 2 people. You can see the Wheel at The Island from the deck but the cabin still feels secluded. My only concern was the staircase. It is very steep and the steps are too short. We will use CabinsUSA again. Thank you for all of your kind words! We here at Cabins USA strive to give each of our guests the best stay possible while vacationing in the Smokies. When you are ready to stay with us again, please mention you are a return guest for an additional discount. Thank you for choosing Cabins USA and we look forward to having you as our guest again! The cabin was great, and we enjoyed our 3 nights there. Wish we could have stayed longer! One issue we had was we did a late check in because we didn't arrive until around 2am after driving 8 hours from Michigan after getting off work, we got our packet in the after hours box and followed the directions to the cabin but the code they gave us to get into the cabin did not work. We had to call the after hours maintanence line and luckily the nice gentleman on the phone was able to reset our code so we were able to get in without having to wait for someone to come out which was nice. Also the drain on the jacuzzi tube in the bedroom would not close all the way for the tub to fill so the water kept draining out, we just decided not to use it instead of calling and having it fixed but they may want to send someone out to look at that! Otherwise I would highly recommend this cabin, we had a great time and definitely plan to return! We also want to return again with a large group of our family and rent one of the larger cabins! Thank you for all of your kind words! We here at Cabins USA strive to give each guest the same great stay you enjoyed while vacationing in the Smokies. Thank you for letting us know about the jacuzzi tub. Your comments have been forwarded to our maintenance department to be addressed. When you are ready to stay with us again, please mention you are a return guest for an additional discount. Thank you again for choosing Cabins USA and we look forward to seeing you again soon! its a very cool little cabin and very comfortable. Thank you for taking the time to let us know about your recent stay in Angel's Ridge! We here at Cabins USA strive to give each guest the same great stay you enjoyed while vacationing in the Smokies. When you are ready to stay with us again, please mention you are a return guest for an additional discount. Thank you again for choosing Cabins USA and we look forward to seeing you again soon! Thank you for taking the time to let us know about your recent stay in Angel's Ridge! We here at Cabins USA strive to give each of our guests the best stay possible while vacationing in the Smokies. Thank you for choosing Cabins USA and we look forward to having you as our guest again soon! My husband and I enjoyed our stay. The cabin is beautiful and the location is great. We will definitely stay here again. Thanks Cabins USA! Thank you for all of your kind words! When you are ready to stay with us again, please mention you are a return guest for an additional discount. Thank you again for your review and thank you for choosing Cabins USA! My husband and I always take our first vacation just the two of us for TOTAL RELAXATION and we where very pleased with EXACTLY THAT!! Everything was perfect from the cabin to the location to the friendliness of the check in! We will definitely be back to experience other cabins in the future! Thank you for all of your kind words! We here at Cabins USA work hard to make sure each of our guests have the same great stay you enjoyed while vacationing in the Smokies. When you are ready to stay with us again, please mention you are return guest for an additional discount. Thank you again for your review and thank you for choosing Cabins USA! Cabin was perfect. My family of four stayed here.kids slept on the pull out couch and there was plenty of room for us four! The cabin gives you the woodys comfort feeling of being in the mountains. The only problem I had was the bedroom down stairs has a draft so bad under the door you have to put a blanket or towel in front of it! It was freezing! Besides that we loved it and didn't want to leave! Thank you for taking the time to let us know about your recent stay in Angel's Ridge! We here at Cabins USA work hard to ensure each of our guests have the best stay possible while vacationing in the Smokies. When you are ready to stay with us again, please mention you are a return guest for an additional discount. Thank you again for your review and thank you for choosing Cabins USA! Thank you for taking the time to let us know about your recent stay in Angel's Ridge! We here at Cabins USA work hard to make sure each of our guests have the best stay possible while vacationing in the Smokies. Thank you for letting us know about the cleanliness issues you encountered. Your comments have been forwarded to our housekeeping supervisor to be addressed. When you are ready to stay with us again, please mention you are a return guest for an additional discount. Thank you for choosing Cabins USA and we look forward to having you as our guest again! We had a wonderful stay but would not ask for this cabin again. We liked the convenience of being so close to downtown Pigeon Forge and the mountain views were nice. It was quiet and peaceful. Being snowed in the cabin for a couple of days was great and the snow made everything around us even more beautiful. Now to the issues we had with this cabin. The dishwasher did not work. There was a DVD player in the bedroom downstairs but only a VCR player in the living room. The stove needs some attention as it has multiple eyes that are broken. The bedroom door needs some insulation because we had to place a comforter at the bottom of the door to keep the cold air from coming in. Drains in both the tub and the bathroom sink were slow and water would stand in them for quite a while after you ran the water. The jetted tub in the bathroom was really useless because even after we had the broken plug replaced, there was not enough hot water to fill the tub to the point that you could use the jets. The steps going down to the bedroom were very steep and going down them was a bit frightening. I believe the carpet makes them more difficult to navigate. It was a wonderful cabin with a great location. We only had one problem, our lock on our main door was broke and we was locked out of our cabin until the maintenance guys came. They were very friendly and cooperative but they had to climb up on the back porch to get us in. They replaced our bottom porch door knobs but that still didn't help us. We waited until noon the next day for the guy to show up to fix our front door lock so we could leave. Other than that, it was a great stay and the staff was very nice. Thank you for taking the time to let us know about your recent stay in Angel's Ridge! We here at Cabins USA work hard to make sure each of our guests have the best stay possible while vacationing in the Smokies. I apologize for the issues you experienced with the lock, but I am happy to hear our maintenance department was able to resolve that for you. When you are ready to stay with us again, please mention you are a return guest for an additional discount. Thank you again for your review and thank you for choosing Cabins USA! We enjoyed our stay. The cabin was overall in a great location and was in great condition. The only issue we experienced was that the jacuzzi tub, there wasn't enough hot water to fill it. It got to the actual spot where the water was coming out and the water was getting cold at that point. But other than that one thing our visit was so fun and comfortable. Thank you for taking the time to let us know about your recent stay in Angel's Ridge! We here at Cabins USA work hard to make sure each of our guests have the same great stay you enjoyed. While vacationing in the Smokies. I apologize for the issues you experienced with the jacuzzi tub. Your comments have been forwarded to our maintenance department to be addressed. When you are ready to stay with us again, please mention you are a return guest for an additional discount. Thank you again for your review and thank you for choosing Cabins USA! Angel Ridge was a nice getaway from the hectic life. It's location was close enough to shopping and restaurants but far enough away to give you that "woodsy" feel. This was out 2nd trip to Angel Ridge and we plan to come again next year. Thank you for all of your kind words! We here at Cabins USA work hard to make sure each of our guests have the same great stay you enjoyed while vacationing in the Smokies. Thank you for continuing to choosing Cabins USA and we look forward to having you as our guest again! My absolute favorite thing about Angel's Ridge was the location. It's so easy to get right back on the strip, but you also have a mountain feel where it is located. Very cozy and cute! I could totally live in something like that! The only thing I didn't really like was That the covers and comforter weren't recently washed clean. Thank you for taking the time to let us know about your recent stay in Angel's Ridge! We here at Cabins USA work hard to make sure each of our guests have the best stay possible while vacationing in the Smokies. I apologize for any issues you experienced with the cleanliness during your stay. Your comments have been forwarded to our housekeeping supervisor to be addressed. When you are ready to stay with us again, please mention you are a return guest for an additional discount. Thank you again for your review and thank you for choosing Cabins USA! Cabins USA was once again wonderful and so easy to deal with. Karen in reservations is always so helpful and willing to go out on a limb and give you an opinion, she did not fail this time either! Angel's Ridge was close to the Parkway, easy to navigate to, and perfect for 2 people! Nice hot tub and I loved the screened in area which will be great when bugs are out. The roads are a little steep and some hairpin turns could be problematic in bad weather. Thank you for all of your kind words! We here at Cabins USA work hard to make sure each of our guests have the same great stay you enjoyed while vacationing in the Smokies and our employees appreciate being recognized for their excellent customer service. When you are ready to stay with us again, please mention you are a return guest for an additional discount. Thank you again for your review and thank you for choosing Cabins USA! I feel that you need another hand rail on the stairs...one that will go full length of stairs because they (the stairs) are a little steep. Also, you need a new mattress on the bed. Everything else was great. The only problem we had was the fact that the hot tub was broken and we were never notified in advance. We were so looking forward to spending lots of time in it. Everything else in the cabin was excellent and comfortable. We enjoyed it tremendously. It made the stay very good. Thank you for a wonderful 9 days in the Smokey Mountains. I am so happy to hear that you enjoyed your stay in Angel's Ridge! We here at Cabins USA work hard to make sure each of our guests have the best stay possible while vacationing in the Smokies. Thank you for letting us know about the hot water. Maintenance has been made aware and will be correcting that issue. When you are ready to stay with us again, please mention you are a return guest for an additional discount. Thank you for choosing Cabins USA and we look forward to having you as our guest again! The cabin was clean but we were suppose to have a hot tub on the deck. The hot tub was empty. That was one of the main reasons we booked the cabin. It was very disappointing. Carpenter bees were eating the screened in porch so sawdust was falling from the ceiling. Upon leaving the lock would not lock. Very frustrating . It was 7 am so we couldn't get ahold of anyone. I really enjoyed my stay. The only problem was there were bees all around the cabin. I am happy to hear that you enjoyed your stay in Angel's Ridge! We here at Cabins USA work hard to make sure that each of our guests have the same great stay you enjoyed while vacationing in the Smokies. Thank you for letting us know about the bees at the cabin. Maintenance has been notified and will be working to correct that issue. Thank you for choosing Cabins USA and we look forward to having you as our guest again soon! My husband and I really had a wonderful time. The cabin we choose was nice as well however, there were a couple of very minor things that I felt needed to be addressed. First, the dishwasher would not stop running it had to be manually turned off and door in the bedroom has a large gap underneath so we had to put a towel at the bottom of the door and the hot needs to be updated because there are no controls so that you can adjust the temperature and all of the jets were not working. Other than those minor things the cabin was very nice. We have used Cabins USA every time we have stayed and will continue to book with them and would highly recommend Cabins USA to anyone. Thank you for taking the time to let us know about your recent stay in Angel's Ridge and I am so happy to hear that you and your husband enjoyed your cabin. I apologize for the maintenance issues you experienced during your stay. Those have been forwarded to our maintenance department so they can be corrected. When you are ready to stay with us again, please mention you are a return guest for an additional discount. Thank you again for your review and thank you for choosing Cabins USA! We were totally satisfied with our stay at Angels Ridge, The cabin is beautiful, with nice view,comfortable furniture, and everything was in good working order. After having a bad experience in another cabin prior to our stay at Angels Ridge, we were extremely happy with our stay. I am so happy to hear that you enjoyed your stay in Angel's Ridge! We work hard to make sure that each of our guests have the same great stay you enjoyed while vacationing in the Smokies. Thank you for choosing Cabins USA and we look forward to having you as our guest again! The cabin itself was absolutely beautiful. However, the proximity to other cabins was a little close for our comfort. The outside hot tub could use some maintenance on the jets. I bit more pressure would have made this stay a 10. I am so happy to hear that you enjoyed your stay in Angel's Ridge. Thank you for letting us know about the water pressure in the hot tub. We will be sending maintenance to the cabin to assess that issue and correct it. When you are ready to stay with us again, please let our reservationists know you are a return guest for an additional discount. Thank you again for your review and thank you for choosing Cabins USA! They need to make sure that the cob webs are out of the corners and by the windows. And the temp was a big difference from upstairs and the basement area. Other wise it is a really nice cabin. And the location is good. Need to tell in the booking that it is a steep incline getting to the cabins.